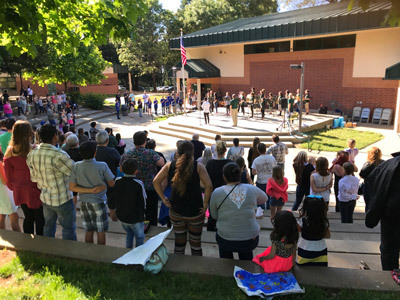 Hundreds Flock to the Annual Camino School "Spring House"
It’s an idyllic spring evening, and hundreds of students, educators, and family members cover Camino School’s campus for their Annual Spring House – a community event that highlights the accomplishments and success of Camino students throughout the year. A variety of booths offer everything from information about the school’s Interact Club to Jamba Juice. The rich smell of BBQ fills the air as John Sanders, of Old Town Grill and Smith Flat House, flips delicious burger patties on a large grill for a long, anxious line eager to fill their plates with what John’s team has in store. As you walked through the children enjoying the playground and over the hill to the packed amphitheater, you begin to hear music and children singing. Grade by grade, students perform coordinated dances, skits, sing songs, and even square dance! Parents look on proudly, and everyone has their phones out to capture the moments. Another highlight of the evening was the presentation of several awards to members of Camino’s Interact Club, which is administered by the Pollock Pines-Camino Rotary Club and teaches students leadership and community service skills. Award recipients: Cameron Douglas, Diego Beas, Shane Silva, Jake Schultz. Volunteers also conducted a book fair in the library and a showcase of student art by grade level in the gymnasium. For more information about Camino Schools.